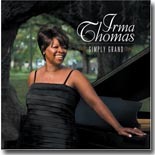 The Soul Queen of New Orleans, Irma Thomas, is back with a fine disc, Simply Grand, on which she's backed by a series of noted pianists. It's this month's Pick Hit. California blues impresario Bernie Pearl pays tribute to many of the guitarists that have influenced his career on this double CD, our Surprise hit. A collection of Little Richard's great Specialty Records hits is highlighted in this month's Flashback feature. Our What's New section features new releases from Tomcat Courtney, Chris James and Patrick Rynn, Travis Haddix, Carlos del Junco, Liz Mandeville, Miss Blues, Scissormen, Scott Ellison, and more.